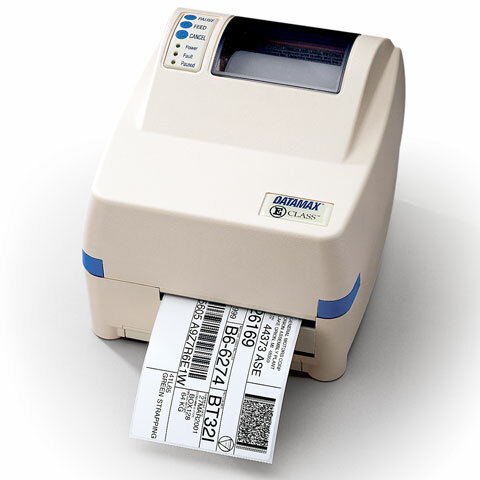 The Datamax E-Class thermal barcode printer family is designed to be the printer of choice when value, performance and features are the primary printer requirements. The E-Class Family consists of the E-4204 and E-4304 printers. E-Class printers are capable of printing a wide variety of labels in applications ranging from small office shipping requirements to compliance and general purpose product identification labels and tags. Hospitals, medical laboratories, automobile service shops, shipping/mail centers, and inventory stock rooms are all typical examples of the types of businesses that can benefit from using the E-Class printers. And with PDF417 and MaxiCode 2D barcode capabilities, the E-Class can print complex transportation symbols and label formats. The E-Class printers are available in both Direct thermal or Thermal transfer configurations and are available with an options list developed to suit virtually any low- to medium volume label printing application. E-4304, Thermal transfer, 300 dpi, 4 ips, 4.1" print width, USB interface, 2MB DRAM, 1MB flash. Includes US power cord. Order cables separately. See accessories. E-4204, Direct thermal with thermal transfer covers (requires (Part# OPT78-2354-01) for thermal transfer capability), 203 dpi, 4 inch Print width, 4 ips Print speed, RS-232 Serial, Parallel and USB Interfaces, Cover and Standard Media Sensor. Includes US power cord.